I got to thinking the other day about my drums and their stories. Or is it about my stories attributed to the drums. Either way I believe that each drum, if it falls into the hands of a professional player, ends up with a story to tell. I am not a vintage drum collector but I have many drums and each has a tale to tell. Their story can range from how I got the drum, where it was used or the individual or company that made the drum. 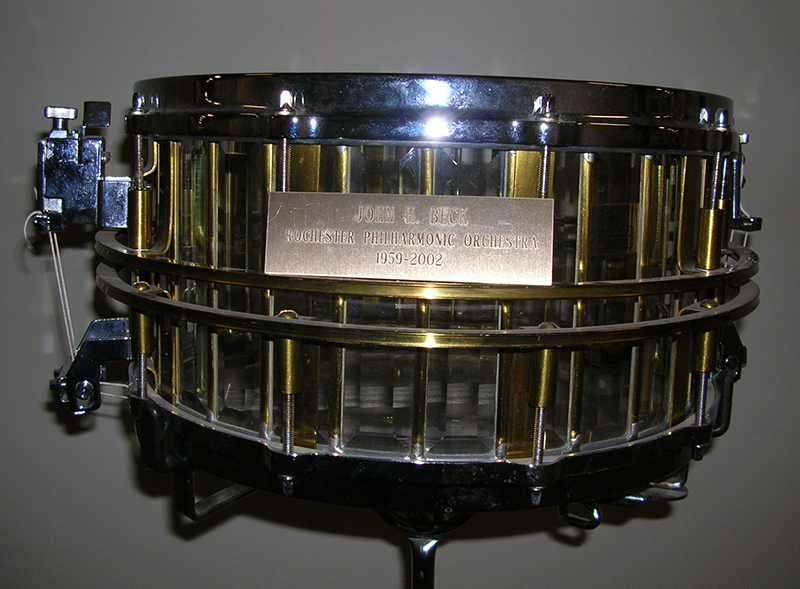 I have already written about my 6 ½” X 15” single-tension Leedy Snare Drum - (March 2014). It opened the Eastman Theatre in 1922 with a fortissimo snare drum roll played by William G. Street for the Star Spangled Banner. The drum was then used by Oliver Zinsmeister in the “President’s Own” United States Marine Band and probably spent a few gigs at the White House. The drum is now here with me at the Eastman School of Music and has been used for many formal occasions involving the Eastman Theatre. Not a bad history for such a drum. In another article for Not So Modern Drummer, I have written about the Rogers Drums that are part of the Eastman School of Music Percussion Department - (September 2014). 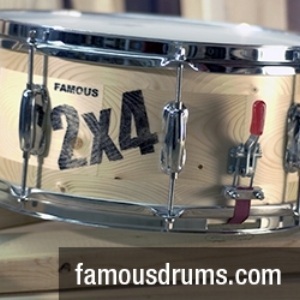 I would like to single out one of the Rogers 6 ½” X 14” drums that is my personal snare drum. The Rogers Drum Company gave the drum to me since I was endorsing the drums and supplying the Eastman Percussion Department with their equipment. Now why is one drum so important? This drum was in my studio and played on by all the students for their lessons. It also had another function. It was the drum used for all the auditions at the school. I auditioned 1,618 students in my 49 years of teaching – only 258 of those who auditioned were accepted. This drum has seen the best and the worst. If it could talk, I am sure it would have stories to tell. REPLICA DRUM AS USED BY 71st (HIGHLAND) REGIMENT OF FOOT – FRASER’S HIGHLANDERS – 1776-1787 – LIMITED EDITION NO. 233- MADE IN ENGLAND BY THE PREMIER DRUM CO. LTD. I also had W.H. Reamer make the same drum for my son. Now we have matching father and son drums. He was also in the “President’s Own” United States Marine Band and has the Eagle and the Globe and Anchor on the shell. As I mentioned in the previous paragraph about having a son who gives great gifts at milestones in my life, the 6 ½” X 14” Orlich glass drum was a gift when I retired from playing timpani in the Rochester Philharmonic Orchestra after 43 years. 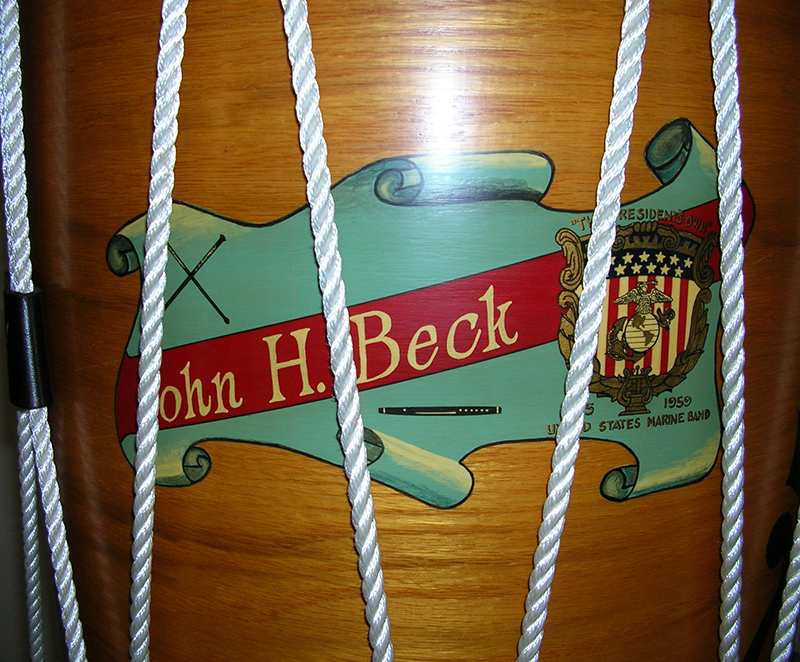 As you can see the plaque reads – JOHN H. BECK – ROCHESTER PHLHARMONIC ORCHESTRA - 1959-2002. This drum was a big surprise to my students as well as some auditioning students. I always had my Rogers Drum for them to play on but had the glass drum there so they could experience its tone and feel that I might add is great. There you have the story of MY DRUMS – THEIR STORY. 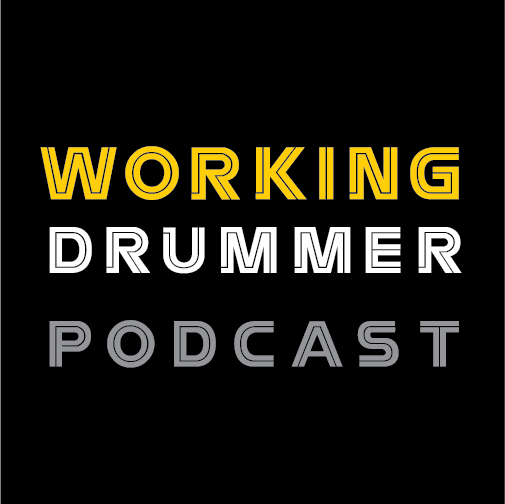 You can decide if drums have a story or the player gives them their story – I think it is collaboration between the two or said in another way – IT IS A WIN WIN SITUATION.